Dental Plans can cover between 10% and 60% of teeth cleaning costs. You should get your teeth cleaned by a dentist at least twice a year. With the savings from just the regular teeth cleaning visits you will of most likely paid for your dental plan for the entire year. When you compare a dental insurance vs. Dental plans you will see that in many cases a dental plan can save you more per year. This is especially true if you have pre-existing conditions. In many cases dental insurance plans will not kick in for 6 months or even a year. This is to prevent people from getting insurance right before they need to see a dentist and then ditching the insurance right after the dental visit. Dental plans differ because they are a discount dental plan and not insurance. Dental plans allow you to get the services you need at a greatly reduced price. For a family of 3 the cost for a dental plan will vary depending upon where you live and the plan you choose. $149 dollars is a rough estimate of the cost per year. That price equals to around $50 dollars per person per year. I used to pay close to $20 dollars per person each month. My dental insurance bill was almost $60 dollars a month. That is a total of $720 dollars a year for dental insurance and only $149 for the dental plan. If you currently have dental insurance look up the cost you are paying for regular cleanings and compare it against some of the dental plans offered here. Do I have To Switch Dentists? The answer depends on where you live and the plan you end up picking. To see a list of dentists in your area and to ensure your dentist is on the list please enter your zip code on this page. You will be able to see a full list of dentists and ensure your dentist is on the list. You will also see what plans that dentist accepts. Now you can compare that dental plan to any dental insurance plan to ensure you are getting the coverage you want plus the discounted rate that will work for you and your family. 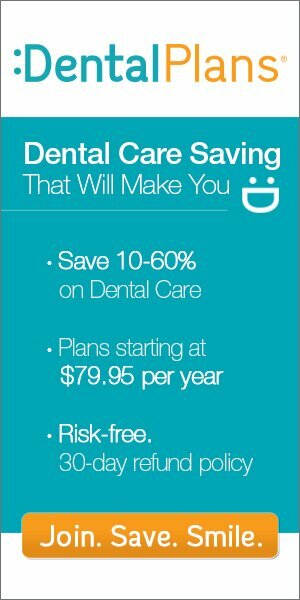 For those needing a better price at the dentist you can truly save hundreds of dollars each year by using a dental plan over dental insurance. It is important to think about your specific needs when choosing a dental plan. If for instance you know your child will need braces or you will need bridge work done in the future you should choose the plan that gives you the best rate.